Hey Gang! Sorry for taking a while to get something new on here, but school and work have been playing havoc with what little free time I have. Here's something odd to throw in here though. I don't know if Organ Grinder Pizza was a chain or not, but one of their primary features was their huge pipe organ. This album features some of the music played on that instrument. It's a pretty eclectic mix here (YMCA?? ), and I hope you like it! Organ Grinder Pizza closed in 1996, but this site has some great pictures of the restaurant and their organ. BONUS: Here's a commercial for Organ Grinder Pizza! 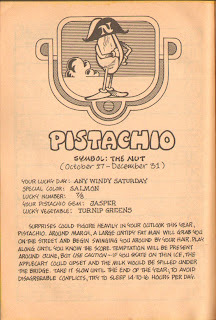 Here's where I fall in the Prof. Otis G. Firefly zodiac: under the dubious symbol of Pistachio the Nut! That seems strangely appropriate somehow...! 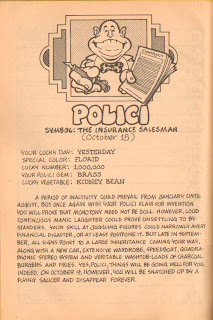 That concludes the zodiac portion of "Prof. Otis G. Firefly's Phantasmagoric Almanac". I hope you all enjoyed it! Remember how I promised all of you born on October 16th a special surprise yesterday? Well, here it is. 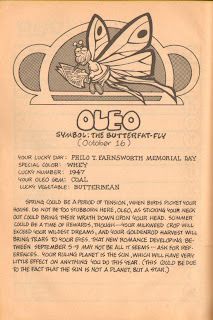 You've got your own zodiac symbol to yourself just like the October 15th kids! Isn't that lovely? 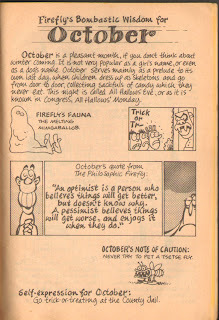 Here's your Prof. Otis G. Firefly wisdom for October, right on time (because I'm putting it in in August)! Enjoy! !